A casement window is a type of window that is hinged at the side and operated by a lever or crank. Prior to the arrival of the double-hung window, the casement window was the most popular type of window, so examples can be found with a wide assortment of hardware and features. For the home decorator it is important to know if your casement window opens inward toward the room or outward toward the yard. Modern casement windows such as the Pella® Designer Series windows feature optional between-the-glass blinds, shades, panels and grills. These types of casement window treatments are excellent choices for cleanliness, the reduction of allergens and safety access by small children. If you have the option to select your casement window during the building process, then you should consider the window treatment options offered by your window provider. If you are decorating an existing home with casement windows, determine if they swing inward. If they do, then you have to make additional allowances for window opening and movement. Most standard curtain rods that mount above and to the side of window moldings will also work for casement windows but you should calculate your window dimension to allow your drapery choice to open past the window to the molding. Your draperies when fully open should collect to the side of the window such that the window is easily accessible and can open without catching on the fabrics. 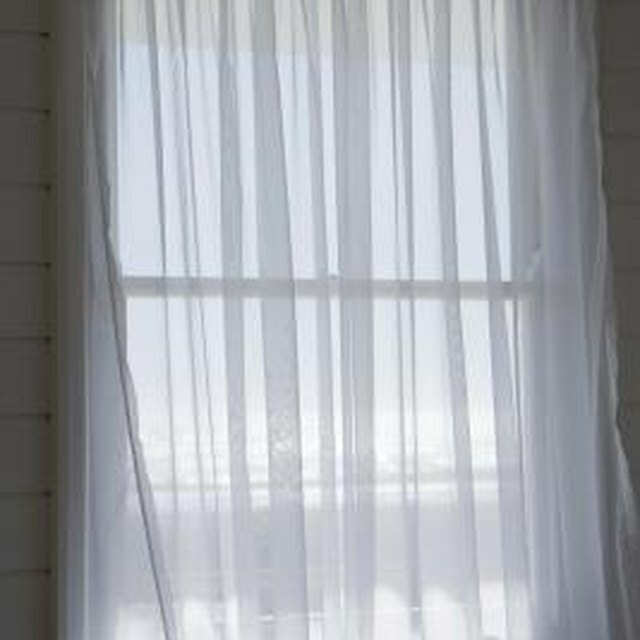 Generally, you should not hang sheer draperies where they will interfere with the window opening. If your casement opens inward then you can usually mount a sheer panel within the window frame that will move with the window. These panels create a more structured appearance than draped sheers, and they do provide the privacy of a sheer panel. They also add another layer of texture and design to the window. If your windows are too close to a corner or other obstruction making it difficult to add the necessary hanging room when the drapery is fully open, then you should consider using a portiere rod. A portiere rod (sometimes called a swing rod) is adjustable and hinged, (on the same side as the window hinges) and especially designed for corner and casement window applications. When used with a casement window treatment, the portiere rod swings into the room with the window, not obstructing the window and not blocking the view. They are available in both standard and decorative styles and most finishes. A window treatment should finish near the bottom molding of the window or drape all the way to the floor. Standard drapes just brush the floor or puddle at three inches for a more dramatic effect. Draperies hung on rods above the window can be mounted above the molding to elongate the appearance of the window but restraint should be used not to raise the rods so high as to crowd the ceiling or make the window appear squat. Since casement windows in older homes are often smaller windows, rods are usually mounted within 2-3 inches of the upper window molding. Pull-backs are often selected to restrain open drapery panels even further, particularly if your windows are breezy. Drapery design choices for inward opening casements are virtually limitless with the exception of toppers such as cornice boxes, scarves or any valence that will make contact with the window movement. Select a drapery design that complements the age and style of your home, one that works with the features and architectural details that add to your home's beauty and value.